Micanti has proven to prevent fouling and to keep the same speed of the vessel on many occasions. Therefore, fuel savings will automatically be achieved. The percentage of fuel savings is determined by the voyage factor. Conventional antifoulings degrade in time and fuel consumption increases in time. The physical barrier of Micanti’s antifouling guarantees long lasting protection. If removal after 5 years is required, the film can be removed without damaging the underlaying anticorrosive paint. Scraping and blasting is not needed. 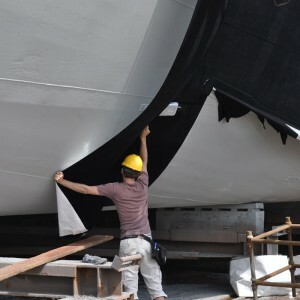 A new Micanti Antifouling film can be applied right after the removal of the previous film.